Whether we know it or not, we all rely on a few basic strategies for moving through the social world. Different people adopt different strategies. Some try to be helpful and friendly; others aim for perfection. Some try to be attractive and productive, while knowledge is the goal for others. The problem is that most of us have been using the same strategies for too long. They worked at some point, but we forget that we are seeing the world through our own unique lens—and that perspective can sometimes be limited. These adaptive strategies become a kind of “programming” we repeat over and over again, even when it doesn’t fit the situation we are in. We’ve probably all heard someone describe somebody else (often somebody they don’t like) as having a “big ego.” And we all know what this means—this person displays an outsized sense of themselves and their own importance. But the ego—or personality—is not the bad guy in this story. Being an “unconscious” person or an “unconscious” leader is actually a fairly normal way of functioning. It simply means the default “programming” you developed to survive in the world ends up driving most of what you do. It becomes business as usual: “just the way we are.” When this is the case, we are operating defensively, out of a subconscious desire to protect ourselves from threatened changes to our “programmed” leadership methods. Complicating this defensive process is the fact that our physical brains also get involved. The design of our brains motivates us to react according to biological, wired-in “programming” we often don’t have conscious control over (unless and until we learn our way out of it). So, it’s part of being human to get defensive, respond impulsively from a negative filter designed to detect threats to our well-being and get emotionally triggered by things that make us anxious or fearful. When you feel anxious about paying your mortgage or terrified before the big speech you have to give or you throw a fit when someone cuts you off in traffic, you can relax in the knowledge that you are a normal member of the human race. However, while it’s just a natural part of being human to respond in automatic, preprogrammed ways, these automatic defensive responses to perceived threats are often ineffective strategies for addressing situations successfully. Because they were created out of an early event (that may have felt like an emergency) our reactions can be rigid, fixed, and hard to change. So, we can overuse a specific strategy or strength, simply because it worked in the original setting. In light of the omnipresence of these “pre-programmed” strategies and reactions, the most important thing we must do to more consciously manage our behavior (and rise above our defensiveness) is to develop the ability to notice, observe, and reflect on our automatic, habitual responses in a nonjudgmental and compassionate way. This is why I like the Enneagram. 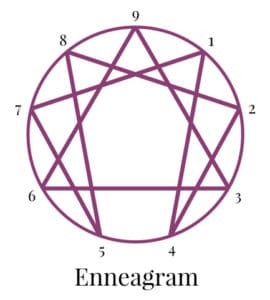 As a holistic framework for understanding personality, the Enneagram serves as a roadmap you can consult any time you find yourself lost or confused by what is happening between you and the people around you. According to the Enneagram model, there are a finite number of personality styles or “types” corresponding to a finite number of key adaptive strategies. And when I say there are a “finite number” of identifiable coping strategies, there are exactly … nine. Each of the Enneagram’s nine types of specific focus of attention grows out of a central “coping strategy”—the go-to method for getting around, adapting to the environment, and surviving in the world. At its core, each of these nine personality styles is basically a “defensive” structure—an inner program that operates automatically to protect us from being hurt or feeling uncomfortable. In addition, the patterns that make up the personality also represent our particular strengths, specialties, and superpowers. The Enneagram map of these nine personality styles provides a clarifying framework for understanding why you (and others) do the things you do because it highlights the specific patterns of reactions associated with the nine styles and what motivates them. And when you can study your habits and patterns with more clarity and objectivity—which the Enneagram personality descriptions provide—you can use your increased self-awareness to decide what behaviors you want to continue to engage in, and what behaviors you may want to change, if any. To be a conscious leader, you need to have a clear sense of your “programming” and be able to recognize when you get stuck on your personal autopilot. The solution to unknowingly operating in this default mode lies in your ability to see and own what you are really doing, thinking, and feeling. This allows you (eventually) to expand the repertoire of strategies you use to cope and function in the world—and to deploy the best strategy in each situation instead of always employing the narrow set you are most accustomed to using. Having a clear window into your personality (and what motivates you) is key to understanding how (and why) your “programming” operates the way it does. The Enneagram system is a proven way to make sure you wake up from “sleep mode” without relapsing into ineffective or irrelevant coping strategies. 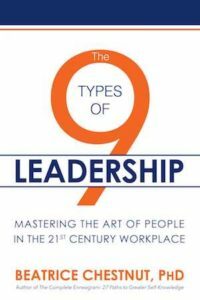 Adapted from The 9 Types of Leadership: Mastering the Art of People in the 21st-Century Workplace by Beatrice Chestnut, published by Post Hill Press.